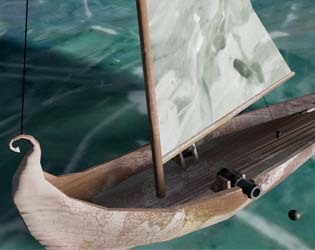 Harsh Winds is a fast paced local versus game With realistic sailing and weather mechanics in a detailed yet stylised visual style. A game for 2 seafarers, where both take the helm of sailing ships in a fast paced skirmish where your skill at riding the winds will give you the upper hand in a fight! one other willing seafarer to fight against. 2 Controllers / gamepads for best experience, however shared keyboard or combo can be used instead. If you are a landlover with no prior sailing experience it is suggestible to look into tacking, a sailing technique used to travel up windnind.